KFC So Good Moments ~ Philippine Freebies, Promos, Contests and MORE! 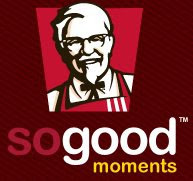 KFC Philippines lets you enjoy great prizes in their 'So Good Moments' contest. Simply share a pure, effortless, genuine pleasure you've experienced on either a short write up, photo, or video. Upload it on KFC's so good website and complete this line, " _________ is so good! ", with a word that captures what your so good moment is about. Submit as many entries as you wish in any category for a chance to win GCs for 11 KFC buckets. Concurrently ongoing is the So Good Super Mom photo contest. To join, take a photo of your family eating a KFC bucket and share a so good mommy tip. 11 moms will Win tons of prizes including 1 year supply of KFC Bucket Meals, Manila Ocean Park Family Package, features on TV and magazine, Manila Ocean Park passes and overnight accommodation at Hotel H2O and an anti-stress body wrap and Mind and Body Flow massages from The Spa. Visit the official KFC so good moments at kfc.com.ph/sogood. Should be original and should not contain trademarks owned by or related to companies deemed as competition by KFC Philippines. Image manipulation is not allowed except basic cropping, adjustment of brightness, contrast, and color correction. No obscene or offensive entries. At the end of your entry, fill up this line: ______________ is so good. Just add a word that can capture what your so good moment is about. Photo should be original and should not contain trademarks owned by or related to companies deemed as competition by KFC Philippines.